Barbie: Is She Evil or Good? Over the past decade there has been attack after attack criticizing the message that one of Mattel’s most popular toys, Barbie, is sending to young girls. 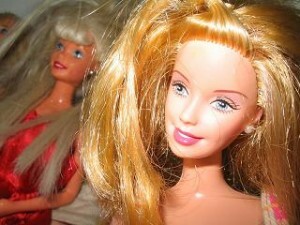 Critics claim that Barbie is giving young girls an unrealistic perception of body image. Although I may be several years behind in adding my voice to the argument, I would like to add my opinion now: I completely reject the idea that Barbie causes girls to have idealistic visions of the human body. Barbie actually teaches children to have pride in their bodies and learn how to beautify them. If there are girls that do have body image issues, I suggest you first look at their mom before you falsely accuse Barbie. The point of owning a Barbie doll isn’t so that a little girl can stare at it and say, “I want to look like that!”. Imagine a 5-year-old doing that everyday! It’s a ridiculous idea. What makes little girls love Barbie dolls is the fact that they get to create new outfits for her and do her hair in interesting ways. So rather than teaching girls that they aren’t pretty, Barbie is basically a training tool for them to learn how to beautify themselves. And when someone feels beautiful, their self-confidence rises and they are more successful in school, work, relationships, and just life in general. Looking at the other end of the spectrum, G.I. Joe also has earned a reputation for teaching little boys what the perfect “man” looks like. But I’ve certainly never heard a 4-year-old say, “Hey mom, I want to have broad shoulders and a small waste like G.I. Joe one day!” No, instead the kid is too busy using his imagination to find new adventures for his G.I. Joe to have, such as climbing to the highest reaches of a tree or locating a lost item in the house. Jumping back to Barbie, the Mattel enterprise has now begun using her fame to make her the lead in many of their digitized, animated movies. These movies actually are incredibly popular among certain age groups. In some of them, classics such as “Thumbelina” or “A Christmas Carol” are recounted, while others have completely original plot lines. In either case, the movie teach the same good values that any good children’s show should teach, thus exonerating Barbie from the guilt of being beautiful. I suppose it was pretty useless to write yet another article about this age-old debate. With the age of technology, dolls and toys are being replaced with phones and Facebook. There is an entire generation of little kids that are about to grow up without a Barbie in sight, beyond the digital ones they may find. And with infinite outfits, hairstyles, and make-up to choose from in a digital format, they will be body image experts by the age of 10. Tiffani Azani is a freelance writer for MyCollegesandCareers.com. My Colleges and Careers connects prospective students with online degree programs that can help them complete their higher education. With a college degree, the likelihood of you getting one of the top jobs in your field of interest increases.